Jesus warns the Sheep Rustlers. And the sheep. In the passages preceding this one (John 9:35-41), Jesus is condemns the Pharisees as guilty for their lack of unbelief and distorted teachings. The Pharisees believe that they know everything and claim to be clear-eyed. Now, to drive the point home, Jesus uses imagery that first century Jews and Gentiles would be familiar: raising sheep was an ancient and important part of the economy, as was the experience of dealing with thieves and robbers who would seek to “sheep rustle”. To protect the sheep, a shepherd would literally lay down at the gate to make sure that thieves would have to face the shepherd if they were attempting to steal the sheep. 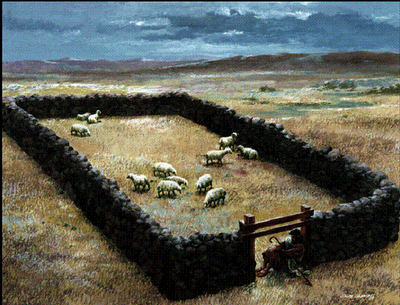 The image above gives a realistic portrayal of a first century sheepfold and shepherd. When Jesus says, “truly, truly”, He is making a statement that is especially important (of course, each and every Divine Word is important, but Jesus helps us by highlighting things that one must not misunderstand by saying “truly”). Note: Jesus says, “Truly, truly..” two times in this passage! The thieves and robbers Jesus refers to are the false prophets and other religious impostors who lead the people (sheep) away from God. The Pharisees are the descendants of other false teachers (Matt 23:29-36). Jesus first explains that there are sheep (people) who are under His guidance and that each and every one of His sheep are called by name; Jesus is making it clear about the very personal nature of His relationship with each of His flock. Those who have been called, follow Jesus with lives of devout and unwavering faith and are not deceived by the spiritual charlatans who seek to “steal” them from Jesus. Despite the clarity of versus 1-5, the “all-seeing” Pharisees demonstrate their spiritual blindness: “..they did not understand what He was saying to them” (John 10:6). Jesus, in an act of mercy, repeats Himself. Jesus makes His promise to the faithful clear: “I am the door; if any one enters by me, he will be saved, and will go in and out and find pasture” (John 10:9). Jesus makes another promise: “I came that they may have life, and have it abundantly” (John 10:10); here, Jesus is referring to the salvation of eternal life (John 3:16). As has always been the case as Jesus makes clear, there are “sheep rustlers” who wish to lead the sheep away from Christ. For today’s sheep, the “sheep rustlers” take many disguises: secular atheists who promise socialist utopias, false Christianities that promise prosperity without the pain or a “non-judgmental Jesus” who supports all kinds of perverted behaviors, false religions who deny the divinity of Jesus Christ, religion factions that justify and commit acts of murderous terrorism and good ‘ole materialism. The “sheep-rustlers” are legion.